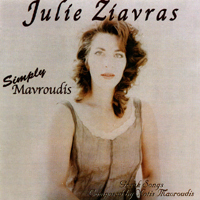 The warm and compelling voice of Julie Ziavras is featured in the newly released CD "Julie Ziavras sings Simply Mavroudis". A collection of 12 songs written and orchestrated exclusively for Julie Ziavras' voice by the renowned Greek composer Notis Mavroudis , it features beautiful melodic vocals accompanied by acoustic Greek traditional and classical instruments, such as bouzouki, tzoura, with Greek traditional rhythms and modes. The collection was recorded in Greece with some of the most prominent instrumentalists in Greece, with a guest appearance of the Greek National Chorus (ERT). Included is a 12 page booklet with English translations and descriptions of the instrumentation, style and genre. The musical influence of Manos Hadjidakis can be heard throughout this album. Hadjidakis had granted sole permission to Mr. Mavroudis to set selections from his volume of poetry to music, resulting in the last selection of this CD entitled "Love Ode or 'Erotiko'", which is dedicated to his memory. These songs represent the only collection of songs Mr. Mavroudis has written exclusively for one singer. In this unique recording, Ms. Ziavras' lovely, liquid voice adds a new lyricism, dimension and color to this beautiful genre. "Greek may be foreign to most of our ears, but Julie Ziavras’ lovely, liquid voice expresses feelings of love, longing and wonder that don’t need translation, although the translations are provided on the liner notes. And the music, featuring a small orchestra, may include such Greek styles as rebetika and hasapiko, but it’s as haunting and universal as the sound of a lonely violin".